UC San Diego students are on the forefront of algae biotechnological research. At UC San Diego, most students go to the beach to relax with friends. The students working in the Mayfield Lab under the department of molecular biology, however, are much more interested in the green algae under the surface of the ocean. Under molecular geneticist Dr. Stephen Mayfield, students and researchers at UCSD study algae to produce industrial products and solutions to the issues of waste accumulation and environmental sustainability. UCSD has been a pioneer in the use and development of cleaner energy for years, starting the research unit Food and Fuel for the 21st Century. Established in 2012, Food and Fuel for the 21st Century strives to connect researchers in biology, chemistry, engineering, and economics to find solutions for renewable sources of food, energy, and products using photosynthetic organisms. As the co-director of the Food and Fuel for the 21st Century, Dr. Mayfield has turned to the algae in the oceans just off of the California coast as the main focus of his research. By studying the molecular genetics and photosynthetic systems of these organisms, Dr. Mayfield’s team at the Mayfield Lab has made antibodies from recombinant protein expressions and biofuel from the natural oils produced by photosynthetic algae. In recent years, the team has also worked to find a way to use algae oil to produce durable foams that are used in many industrial products. Most of the products that we see on the market are made from fossil fuels that add carbon into the environment when they’re burned for energy. As part of the global strive to lower carbon emissions, researchers in the lab worked out the chemistry that would make soft foams from the natural oils in the algae. This bendable foam became the foundation for the soles of the biodegradable flip-flop. There are 300 million people worldwide who cannot afford shoes. For those who can, flip-flops are the cheapest shoes around. Every year, 3 billion flip flops are made to sustain their high demand in the global market. Dr. Mayfield says that flip flops are the number-one shoe in India, China, and Africa. If the team was going to leave an impact, they were going to have to make a global product used by people all around the world — the flip-flop. Despite their popularity, flip-flops only have a shelf life of two years before they start coming apart. They can be taped and mended, but eventually, they are thrown out into landfills and waterways. 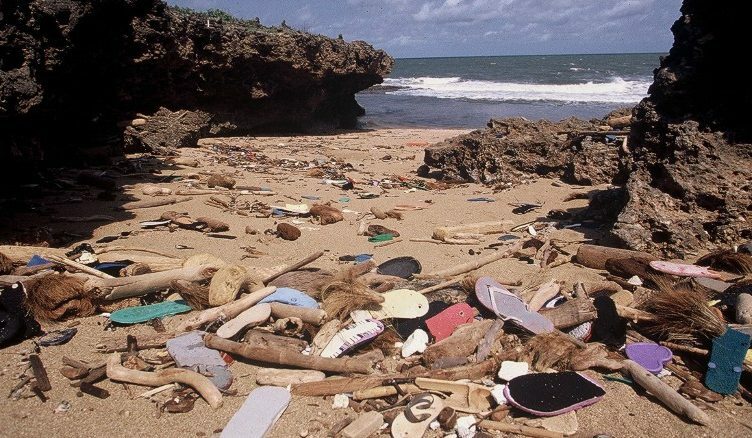 Many flip-flops are made with non-recyclable plastics that end up staying in the environment for a long time, damaging the ecosystem and the plants and animals that live in it. Because of the organic components of the biodegradable flip-flops, these shoes could be thrown along with your vegetable scraps and banana peels into a compost to be recycled by organisms. These renewable flip-flops provide a cheap and sustainable solution to plastic pollution. Most products that use clean energy cost significantly more, which makes it hard for people who have lower incomes to afford these products. An important factor of these flip-flops is that they are accessible. “Renewable flip-flops are easy to manufacture. Someone in India can make this shoe in their garage,” Mayfield said. Take 3D-printed shoes for example. The soles of these shoes use a third of the material used in regular shoes, saving more than half the carbon that regular shoes would require to make. Although these shoes are much more sustainable, they are also more expensive. “It’s the super high-tech solution to our problem. The irony is that we’re using more technology to try to use less resources,” Dr. Mayfield said. High-tech solutions can’t be accessed by everyone in the world, but these algae shoes require minimal technology, allowing countries all over the world to locally produce renewable flip-flops and put them out on the local market. These shoes can’t make an impact if they can’t be accessible to those who use them. Mayfield says that innovators behind these biodegradable shoes will be the “Elon Musk of flip-flops,” alluding to the pioneering of electrical cars by Tesla. There was a time when others doubted that a car could run on electricity alone. Now, car companies all around the world are making their own versions of electric cars, accelerating the growth of the electric car industry. Mayfield hopes that their sustainable products made with algae will make its way into the market, drawing the attention of consumers and producers alike. It’s a simple business tactic: if more people bought these biodegradable shoes, other shoe companies may follow suit because they see that this industry is booming. “If everybody else copies us, that will be the best win,” Dr. Mayfield said. If renewable flip-flops can expand past San Diego to the world market, then more people will have access to an environmentally friendlier option for footwear. One piece of advice that Dr. Mayfield offers students is to make thoughtful decisions on our consumption as a way to leave a positive impact on the world. For the innovators researching algae, their products will lead as an example of biotechnical possibilities that can change the current environmental situation of our planet.